In the latest round of hotel Monopoly, French brand AccorHotels has announced its plans to acquire three new brands — Fairmont, Raffles and Swissôtel (collectively, FHRI) — in a deal expected to close later this year. TPG Contributor Lane Nieset has gone through the 155 hotels in FHRI’s global portfolio to handpick five favorites that will soon fall under the AccorHotels umbrella. Earlier this month, AccorHotels shared its plans to acquire Fairmont, Raffles and Swissôtel by mid-2016. It’s unclear how this deal with affect the future of Fairmont’s President Club — or whether the brands will become part of the Le Club AccorHotels loyalty program — but in any case it’s good news that the AccorHotels group is gaining some higher-end luxury properties. Below, I’ll highlight five of the most exciting upcoming additions, featuring properties in London, Paris, New York and beyond. 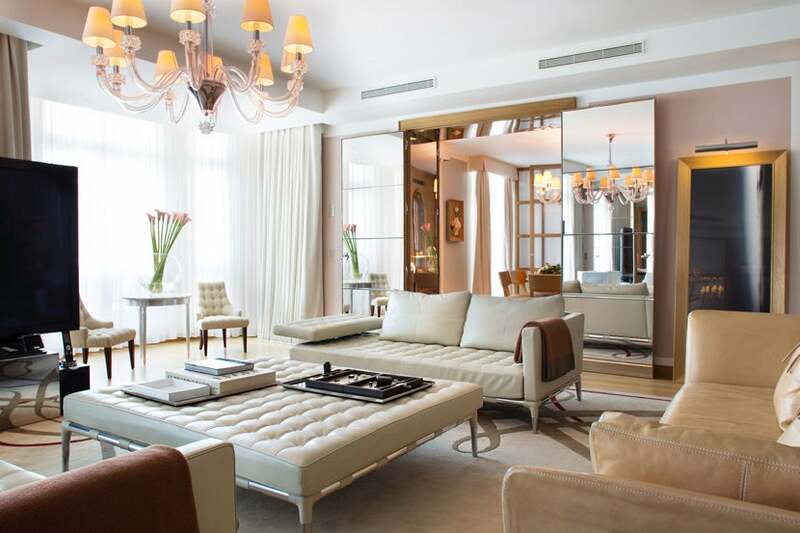 The fifth-floor Katara Presidential Suite at Le Royal Monceau, Raffles starts at a whopping 25,000 euros per night, with direct spa access. Image courtesy of Raffles Hotels and Resorts. It’s hard to get much closer to the Arc de Triomphe than a room at Le Royal Monceau, Raffles. Tucked on the Avenue Hoche just a short jaunt from the Champs-Élysées and Parc Monceau, the five-star spot was built in 1928 and has served as a home-away-from-home for everyone from Ernest Hemingway to Michael Jackson. While it’s still classic in style, the hotel was recently redone by French favorite Philippe Starck, the mastermind behind the custom furniture. In the rooms and suites, you’ll also find French goodies in the mini bar and original work by French artists lining the walls. Amenities here also nod to French brands: Clarins for adults and Bonpoint for children. Home to the longest infinity pool in a Parisian hotel (coming in at 75.5 feet), the hotel also features the first Spa My Blend by Clarins, as well as a hammam and sauna. As if it couldn’t get any better, Pierre Hermé is the pastry chef behind the sweets at both of the hotel’s restaurants. Rates start at 663 euros (about $716) per night. Take a glance at our post, 6 Tips for Using Points and Miles to Visit London and Paris for money-saving pointers. The Plaza Hotel in New York City is a historic landmark that cost $12 million to build back in 1907. Image courtesy of Fairmont. 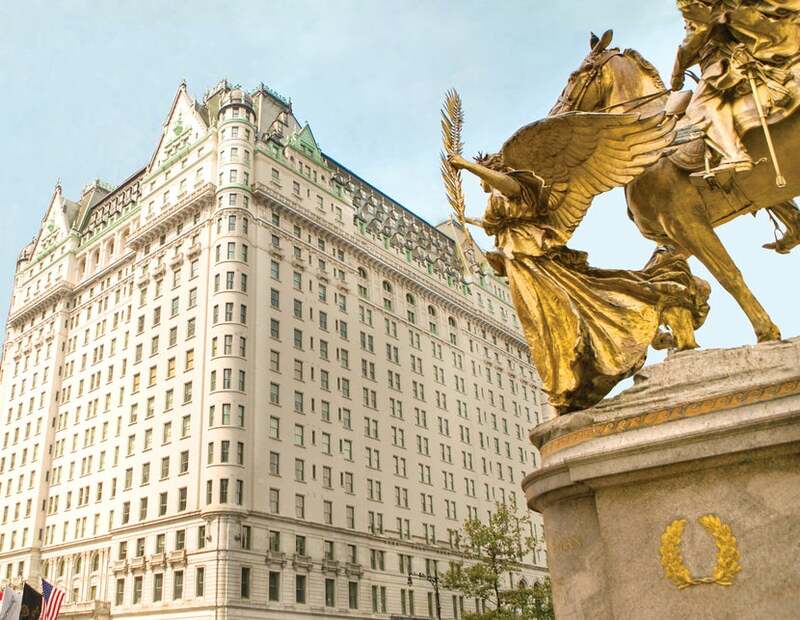 An essential part of New York’s skyline, The Plaza is now more than a century old, and it’s the only hotel in the city to be listed as a National Historic Landmark. When it was built in 1907, no expense was spared, as more than 1,650 crystal chandeliers were ordered and the largest request for gold-encrusted china was placed. Since then, the hotel has been used as a backdrop for films, including Hitchcock’s “North by Northwest,” and it’s served as a lavish setting for both kings and silver screen stars to meet. Managed by Fairmont, the 282-room hotel still maintains its decadence but has added a few new faces along the way, including the Todd English Food Hall and the Caudalíe Vinotherapie spa. Rates start at $775 per night. For more hotel ideas in NYC, see our post, Your Points and Miles Guide to New York City. 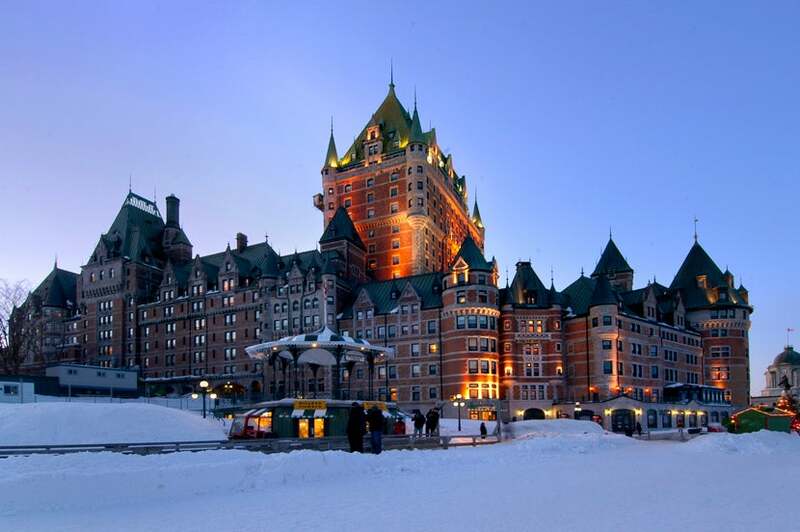 The Fairmont Le Château Frontenac is set within the walls of Old Quebec. Image courtesy of Fairmont. Built in the late 19th century, the Fairmont Le Château Frontenac was named after Louis de Buade, Count of Frontenac, who was governor and helped mold New France back in the 1600s. The 611–room property blends elements of the old and new world, as it’s set inside the walled old city with a 300-year-old stone and overlooks the St. Lawrence River. After a multimillion-dollar renovation, the hotel has been spruced up to modern standards while still maintaining the design of its regal past — after all, it counts King George VI and Queen Elizabeth, as well as Princess Grace of Monaco, among its distinguished guests. Rates start at $166 per night. 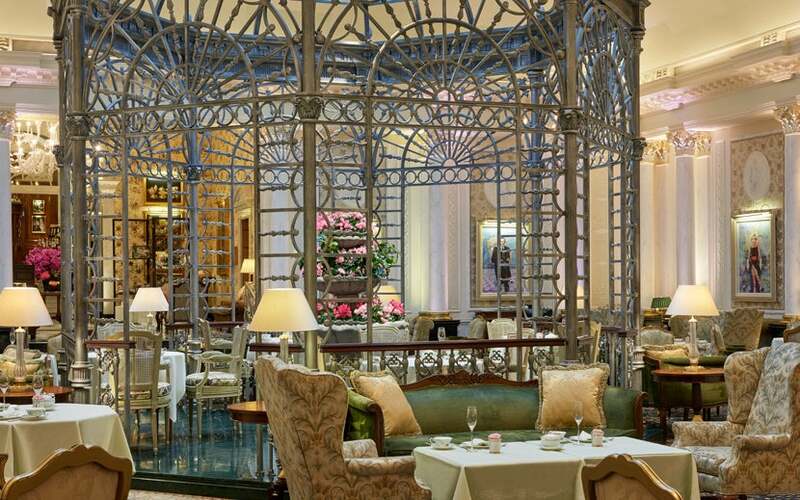 Afternoon tea in the Thames Foyer is one of The Savoy’s signatures. Image courtesy of Fairmont. Fairmont-managed The Savoy, which is on the Northbank of the River Thames, is a London landmark that’s drawn celebrities and royalty since opening in 1889. Designed in Art Deco and Edwardian styles, the 268 rooms include eight suites dedicated to the famous guests who’ve slept in them, including the likes of Frank Sinatra and Claude Monet. The other grand suites aren’t too shabby, either, with Murano glass chandeliers, original fireplaces, sweeping views over the Thames and 24-hour butler service. Afternoon tea in the Thames Foyer with dark chocolate and rose pastries whipped up by pastry chef Ludwig Hely is one of the best parts of a stay at The Savoy. Rates start at $651 per night. For more on London, see our posts, Best London Hotels To Redeem Points and Your Points and Miles Guide to London. 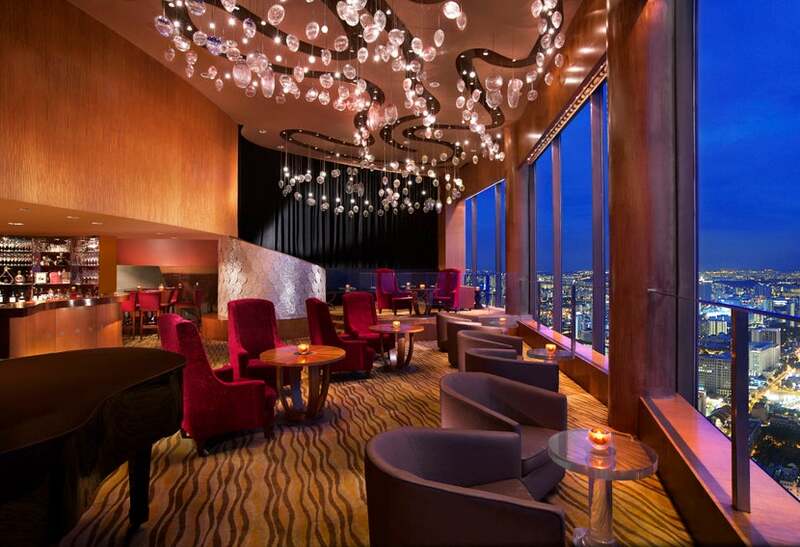 The Stamford’s City Space in Singapore is considered one of the best bars in the world. Image courtesy of Swissôtel Hotels & Resorts. One of Southeast Asia’s tallest hotels, the 1,261-room Swissôtel The Stamford is geared more toward business travelers, but still has all the amenities of a resort complex. It has 15 on-site restaurants and bars, including City Space, which is rated one of the 50 Best Bars in the World as it has panoramic views over Singapore. The hotel also holds one of the largest wellness and fitness facilities in Asia, Willow Stream Spa, which has two pools and an aromatherapy steam room. When it comes to rooms, the suites with private balconies that show off Singapore’s skyline — and a glimpse of Malaysia and Indonesia in the distance – are the best bet. Rates start at 310 SGD (or $219) per night. When planning your next trip to Singapore, check out our posts, Transferring Ultimate Rewards Points to Singapore Airlines and Destination of the Week: Singapore. While none of them are exactly bargains, each of these five soon-to-be AccorHotels properties promise an unforgettable stay with unique decor and fine dining. None of them are yet bookable through the Accor program, but we’ll be sure to keep you updated as the acquisition moves forward. For more on the Accor acquisition, see our post here — and be sure to share some of your favorite Accor and FHRI hotels with us in the comments below.